Facebook Like And Comment menambah tombol like/recommend, juga tombol send, dan bisa menggunakan komentar facebook bukannya komentar wordpress untuk situs wordpress Anda. Setiap posting atau halaman akan memiliki tombol like/recommend di bawah konten posting. Ketika pengunjung mengklik tombol ini, gambar tertentu akan ditampilkan pada dinding facebook pengunjung, judul posting dan kutipan. Jika Anda mau, Anda dapat menggunakan komentar facebook bukannya komentar wordpress standar. 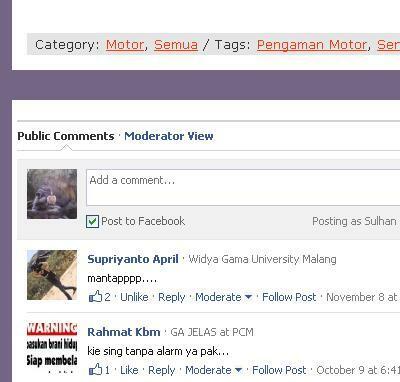 Komentar asli wordpress akan digantikan dengan komentar Facebook. Setiap kali ditambahkan komentar facebook baru, Anda akan mendapat notifikasi melalui email admin. Sehingga Anda dapat segera menyetujui atau melarang komentar. Komentar facebook sebenarnya adalah sebuah iframe. Jadi, mesin pencari tidak akan melakukan crawl komentar di dalamnya. Untuk mengatasi masalah ini, plugin akan membacanya dan membuat cache untuk komentar tersebut, kemudian memasukkannya dalam setiap posting di belakang komentar facebook, sehingga mesin pencari akan melakukan crawl isi komentar tapi tidak akan mempengaruhi tampilan. Ini adalah untuk keperluan SEO. Saya kan pake wordpress gratisan di wordpress.com, apakah plugin ini bisa diinstall disana? Sepertinya website di bawah wordpress.com tidak diberi kesempatan untuk menginstall custom plugin. Jadi sayang sekali plugin ini hanya bisa digunakan untuk website yang menggunakan instalasi wordpress sendiri. Hey, how can i change the language in the plugin? You can edit “facebook.php”. Replace “en_US” on line 180 with your locale code. Alright, I’ll add the language selection in the “setting page” to choose “locale code” in the next version. Hey just installed the comment app and it looks great! My question tho is why am i not seeing comments from facebook showing up below my blog posts? I’ve had 2 so far but its not showing up. Yes, that works great. Is there a way they will also show on facebook on my page as comments? I have no idea. I’m sorry. 😀 bisa aja. Sudah ada beberapa yang aku pakai sendiri sih, tinggal publikasi saja. Tapi kurasa tidak akan mendapat respon sebanyak plugin ini, soalnya yang membuat plugin ini mendapat respon baik adalah karena facebook-nya, bukan karena plugin-nya. I got most everything working thanks. I’m wondering if you can tell me why my images for my blog post don’t come through anymore when I try and share to another site like facebook? It used to pull my image from my post when i shared it and now it will only take 1 generic image for every post? You can add fbImage postmeta with url of the image for its value on each post. This postmeta will override the image specified by og:image field on plugin setting. How and where do we add a fbImage postmeta with image url for its value? I am not a programmer but can you give me the location and exact code to add? Thank you so much! I love this plugin! Om, saya pake scheme dark. Nah, yang latar item itu kan yang di kotak isiannya sedangkan di sekitarnya putih. Gimana supaya semuanya berubah jadi warna item? Saya cari-cari CSSnya ga ketemu. This plugin is not designed to be displayed using shortcode. The button will be displayed below the post content. While the comment will replace the original WordPress comment. But, it will only be displayed on a single post. This plugin is great, but I always get Warning: http://page-en-construction.aminusproductions.com/?p=238 is unreachable. I check the config for the App Domain and Site URL, it is configure correctly, I just donèt know why it “is unreachable”. hello is there an option to have this plugin in certain pages appear and certain pages not appear? No, it will appear in every pages and post. I got it, if I have now 300+ likes and many comments with this plugin and I decide to change to a different plugin of Facebook likes will I keep all my data of people who already like the site? The data of likes and comments are recorded by facebook server, not by this plugin. So, your data are safe. Edit apa? Tidak ada yang perlu diedit. Akan tetapi like atau comment hanya akan muncul pada page atau post yang tunggal. Jadi, jika halaman awal berisi banyak post, maka like atau comment tersebut tidak akan muncul, tetapi begitu diklik pada salah satunya, maka like atau comment-nya baru muncul. Maaf jawabnya lama, soalnya sewaktu pertama melihan komentar ini masuk, koneksi saya sedang lambat, begitu koneksi pulih, saya lihat lintasaceh sedang diperbaiki, jadi tidak bisa memberikan komentar. Dan sekarang sepertinya lintasaceh sudah tidak menggunakan plugin ini, jadi hanya sebatas ini jawaban yang bisa saya beri. Btw, thanks sudah mencoba plugin ini. I really enjoyed this plugin. It was very easy to install. I’m glad to know that I will be able to approve the comments. There were a couple other FB comment plug-ins that I considered or tried, but I found it difficult to set up the data for approving the comments. Being able to approve the comments is pretty important to me. I just wondering… Is there any way to change the “View Comments” text. It would be nice if I could change it to just “View”. What this plugin (wordpress term) do is only make html code so that the facebook plugin (facebook term) can be embeded in our website. The “View Comments” text it self is produced by facebook, not by this plugin. I think your newest post is “social connections” and the Like button also appears at the bottom of that page. => I do not know what to fill. hi! this plugin is a lifesaver! Yes, we have to open each post page to see its comments because wordpress acts like that. This plugin only follows wordpress behaviour. If we use a facebook comment, then the comments of wordpress will be replaced completely using the comments from facebook. I myself have never used a theme like you mean, but I guess if you are using that theme, this plugin will automatically change its comments_template. Installed your plugin, was working fine. My host moved my website to a new server, now my og:image doesn’t show in the settings, nor does it display at the bottom of the new post page. It just says ‘use default image’. If I place a different url for a different image at the bottom of the post page it just says ‘post image’. It did display the image, it doesnt anymore, just text. Tried uninstalling and reinstalling, doesn’t do anything. How do i get it back so it displays my default image or the new image. I think your server refuse the fopen($url,"r") function. The thumbnail is produced by using this function.But don’t worry about the thumbnail. All this plugin need is the url of the image. The thumbnail is only for us as a post writer to see the image. It’s actually there, but I don’t know what make it hidden. Maybe your css, I have no idea. I’m sorry. How do I apply the css class of “meta-comment” into your code, so that the text View Comments, will use my css instead. Currently, the text is blue and not aligned properly! ps: ideally, I like to use my comment icon. Do you notice that one of the posts will not show VIEW COMMENTS but instead it shows a line or something like that!! It does that very often … have to refresh so many times! Can you not tell me how to use my own custom text instead ? 1) There is a function facebook_add_like($content) on facebook.php line 296. You can add any filter there to decide when to show like/recommend & send button. 2) Veiw Comments teks as well as its icon are produced by facebook, not by this plugin. So, I have no idea if we can change it or not. 2) Yeh the plugin works but as I said, sometimes the VIEW MESSAGES does not appear correctly and refreshing the site many times is required. Is there another way of doing / fixing it ?! $cnt.='<div style="display:block;margin-left:auto;margin-right:auto;padding:20px 5px 20px 5px"><div class="fb-like" data-href="'.$this->getUrlThis().'" data-send="true" data-width="'. Notice that there is ‘count’ field on ‘comment’ array. so you can save this number on separate cache file and use it to make your own VIEW MESSAGE text. btw. tapi kok tombol like-nya ga keluar ya di web saya, hanya box comment-nya saja! Sebenarnya tombol like itu ada di sana, tetapi tidak tampak. Saya sendiri kurang mengerti mengapa bisa tidak tampak. Mungkin karena faktor css atau yang lainnya. First, when I switch the comments to dark theme, only the comment input section turns dark. How do I get the rest of the background to go dark also? I’m using Buddypress, with the WP simple community theme. Since its an I frame I can’t change this? I’d rather the whole thing to be dark to match my theme. Second, in your developement, can you include a check box to turn the like button off? Or how can I disable it in the code? Thanks for your awesome plugin. With respect to my previous post, the problem does not appears anymore if I logout from FB then login again. Apakah plugin comment ini bisa dipasang di halaman products? Saya menggunakan WooCommerce di web http://www.bonekaqu.com dan berharap setiap halaman produk bisa dipasang plugin comment facebook ini. Memungkinkan ga mas? Comment bisa muncul di setiap post atau page. 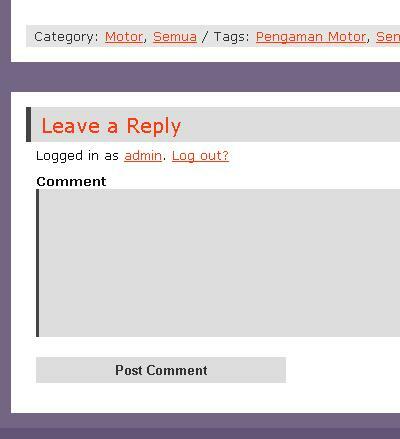 Dan Comment itu hanya menggantikan comment dari wordpress. Jadi, selama theme yang digunakan memunculkan comment dari wordpress, maka comment itu bisa digantikan dengan comment dari facebook. What are we supposed to enter exactly in the “Default image” section at the settings page? I also examined your site and I found too many og:Image on your site. I think, more than one plugin add this meta to your site. how do I change the language to pt_BR? please help me. How can i change the language in the plugin? This is a great plugin! The only thing I’m missing is the possibility to have the fb like-button show on the home page too, for each post that is, rather than only on the actual post page. Is that possible? If your aim is only to make the Like button, then this is possible (not by this plugin). But if we click on the button, the description appear on Facebook wall is depend on og:description meta, and this meta only allowed once. So, we can’t get specific description for each post. That why I only make the plugin to show the button on single post to get specific description. mas, untuk memanage comment yang di approve atau tidak bagaimana ya? Bos saya install plugin ini tapi terus ada error seperti di halaman ini http://www.nukarduit.com/testimonial lalu cara memperbaikinya bgm ya bos..? mohon arahan..? 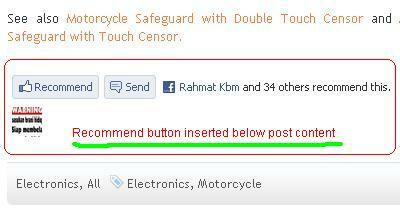 Sepertinya yang jadi masalah bukan plugin Facebook Like And Comment, tapi plugin user-list. I have installed this plugin but I am unable to find comment box on after the posts. How can I get that? No settings option for you plugin on my plugin list and FB comment box doesnot appear instead same wordpress comment is shown. Help me with that. I have read previous comments but nothing seems to be helpful. Is there a way to just set the first image as the og:image field? I understand going into the post and setting the URL to the image; however, I use a blog writer to make my posts and was hoping there was just an automated way to just set the first image? I never tried this, but if you just remove og:image field, then facebook will decide which image to be used. So, just edit facebook.php and then remove the lines which will add that field in function facebook_like_add_meta.